Jack Bell Gallery is pleased to present a solo exhibtion of photography by David Chancellor. Using medium format film, Chancellor documents the tourist trophy hunting industry in Africa today. 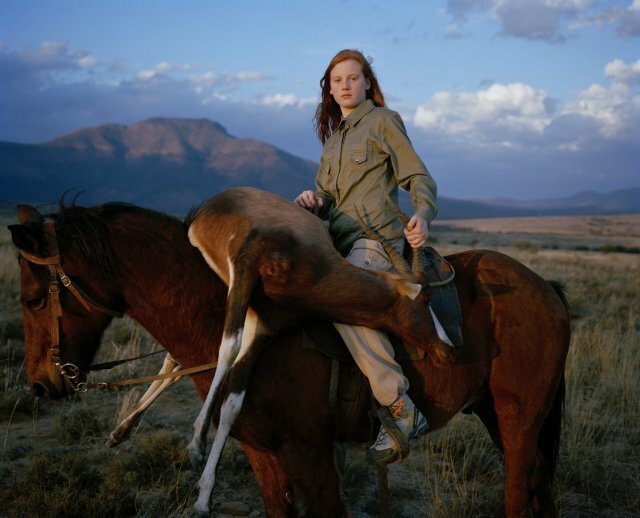 Work from the same series, entitled ‘Hunters’, won the Taylor Wessing Portrait Prize at National Portrait Gallery, London. The show is also accompanied by the launch of a new artist publication. In many parts of Africa the traditional landowners have switched from farming livestock to big game. The landowners become shareholders in these animals and by default become very effective game wardens, making poaching a difficult and risky pastime. Rural Zimbabweans, for example, now encourage foreign hunters onto their communal lands to hunt elephant in exchange for the meat, and a percentage of the revenue derived from these hunts. While a picture of a man who just shot a Leopard may appear loathsome, the whole chain of events becomes less straightforward within a wider context. The industry developed in Kenya in the early 20th century, with wealthy European and American visitors paying landowners to guide them on hunting safaris in the area. Similar tourist hunting scenarios soon developed elsewhere, including Zimbabwe, Botswana and Namibia, and to a lesser extent in Zambia, Mozambique and Swaziland. Now a major industry in Africa, trophy hunting occurs in 23 sub Saharan African countries. Those portrayed here are not the landed gentry of the 19th Century; these are people of today, hedge fund managers, surgeons, doctors, and attorneys. Most save all their lives to hunt game in Africa, which is still accessible if you can afford the sizable price tag. This body of work explores the complex relationship that exists between man and animal sharing terrain, the hunter and the hunted, as both struggle to adapt to their changing environments. David Chancellor, born in London, England, works and lives in South Africa. He has participated in numerous group and solo exhibitions, exhibited in major galleries and museums, and published worldwide. Named Nikon photographer of the year three times, he received a World Press Photo award in 2010 for the Hunters series. Chancellor has exhibited at the National Portrait Gallery, London (2009) where the following year he won the Taylor Wessing Portrait Prize. In 2011 he was a nominee for the 5th Annual Photography Masters Cup, and his work was shortlisted for the Sony World Photography Organization Award, and the Freedom to Create Prize.